Here’s why you should put the Suzuki Swift on your shopping list. THE SUZUKI SWIFT is a bantamweight compact supermini that is surprisingly spacious and has decent driving dynamics. Thanks to its nifty mild hybrid system, it is also pretty quiet and economical to run. 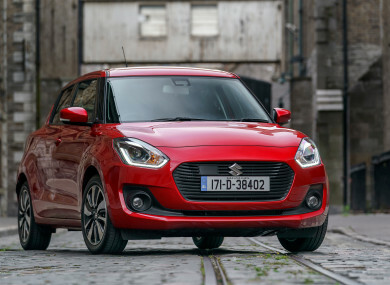 So, if you are in the market for a smart supermini, the new Suzuki Swift might just be the car for you. The Japanese are great at utilising space and the cabin of the Swift is rather roomy for a car of this class. There are acceptable levels of leg and headroom all around and the boot has a 265-litre capacity and a useful square, flat shape. Everything is laid out well and with the car being compact, all switches and buttons are within easy reach. There are a lot of hard plastics about the cabin but not any more than is expected from this segment – and while the cabin doesn’t have the same funky feel as its Ignis stablemate, it is a very functional space with plenty of handy storage areas. Here in Ireland, the Swift is available in SZ3, SZ-T and SZ5 grades. Standard equipment for all models in the range is good and the SZ3 model with 1.2-litre Dualjet engine and manual transmission includes 15-inch wheels, LED daytime running lights, body coloured door mirrors and front electric windows. Inside there are six airbags, air conditioning, leather steering wheel, privacy glass, DAB radio with Bluetooth and four speakers. Stepping up, the SZ-T model is available with the 1.0-litre Boosterjet engine and manual transmission and adds 16-inch alloy wheels and front fog lamps, a rearview camera and smartphone link display audio. My test car was the SZ5 model powered by the 111hp 1.0-litre three-cylinder Boosterjet turbo engine with Suzuki’s SHVS mild hybrid system (Smart Hybrid Vehicle by Suzuki) which brings the Co2 emissions down from 104g/km to 97g/km (Band A2, €180 tax per year). The engine and drivetrain setup in the Swift is pretty nifty. It’s a mild-hybrid system meaning it has a small battery onboard, which is recharged on the move so there’s no need to do anything like plug it in. All this battery does is power some of the electrical and ancillary systems, which helps to take some of the load off the engine, especially under acceleration. It just gives it a bit of a boost. As for the performance, if I’m honest, I’d have liked it to have a bit more fizz. The car feels more than capable of it, and the good news is that there’s a Swift Sport version on the way later this year. The ride quality and handling leave no real cause for complaint – in fact, I think this car could surprise a lot of people who drive it. The hybrid system does help to reduce fuel consumption and if you’re prudent with your throttle input then you should be able to get some decent range from a full tank. Compared to some of Suzuki’s other cars, like the Celerio, the Swift feels solid and stable on the road and while it isn’t going to really excite, it’s a car that is hard to fault. Email “Review: The Suzuki Swift proves that good things come in small packages”. Feedback on “Review: The Suzuki Swift proves that good things come in small packages”.